The key issue in any creative adaptation involves not just an artist borrowing from another tradition but the manner in which the transformation occurs. William Shakespeare borrowed from Raphael Holinshed and other sources. But he creatively transformed his appropriations into distinguished structures of meaning. Similarly, although Anthony Mann borrowed from both Shakespeare and Greek tragedy, the important aspects involve the relationship of these traditions to the Western genre and 1950s culture by means of the director’s transformative patterns of authorship. The ability of any director lies less in the “borrowed” but how the borrowings are creatively applied within any particular cultural transformation having little in common with the original source material. This distinguishes a great director from a derivative hack like Quentin Tarantino. As Hitchcock told François Truffaut, John Buchan “was a strong influence a long time” before he filmed The 39 Steps in 1935. His personal library included the complete works of John Buchan, so he was very familiar with this author. (1) However, Hitchcock had little sympathy for Buchan’s ideology of imperialism. Other factors attracted his attention. Buchan’s social world is foreign to Hitchcock. It is based on rigidly defined class and sexual boundaries that no one ever opposes. “Normality” is never questioned. The system must be maintained at all costs. By contrast, Hitchcock frequently interrogates institutions and their social codes. He also develops those revealing contradictions concerning the fragility of civilized values that Buchan sometimes intuitively recognized but retreated from constantly by placing his characters back into their secure social worlds. In Buchan’s trilogy of novels featuring retired middle-aged Glasgow grocer Dickson McCunn, who yearns for adventure in Huntingtower (1922) and finds himself in the fairy-tale situation of rescuing a Russian princess held captive in a tower by Soviet agents, rigid ideological codes dominate the narrative. During their first encounter, McCunn and World War I veteran romantic poet John Heritage debate the merits of the Bolshevik revolution. The author uses McCunn’s perspective to demolish what he sees as the naïve idealism of Heritage’s “lost generation” character. Eventually, Heritage sees the light and aids McCunn, and a group of impoverished Glasgow slum kids, the Gorbal Die-Hards, in liberating the princess from her tower. But, unlike the mid-1950s BBC TV adaptation featuring James Hayter as McCunn and Richard Wordsworth as Heritage, Buchan’s Heritage loses the princess to her aristocratic Russian betrothed. He accepts the situation according to acceptable class propriety. Once normality is restored, characters return to their worlds of comfortable conservative ideology. For Buchan, adventure is acceptable as long as ruling-class codes remain entrenched. No sense of loss is registered after the final return to normality. Most women in Buchan’s universe unquestioningly accept their proscribed roles in society. Hannay’s future wife, Mary, operates as a secret agent in Mr. Standfast (1919) before accepting her designated role as wife and mother of the appropriately gendered child, Peter John. She can vocally critique the non-Aryan Medina in The Three Hostages as long as her condemnation falls within acceptable boundaries of bourgeois “mother-love” and anger at a villain who has kidnapped upper-class children. Conversely, femme fatale secret agent Hilda von Einem in Greenmantle (1916) terrifies Buchan’s clubland heroes. These gentlemen never perceive that their cultural sexist attitudes define her as a monstrous female. They do not see her as an independent woman existing in a male-defined world. Instead, they stereotype Hilda as a dangerous “other”. By contrast, Hitchcock has intuitive sympathies for his “guilty women” characters and exceeds Buchan in this particular perspective. Hannay’s fears at Hilda’s presence are highly revealing. Hilda significantly reverses Laura Mulvey’s dogmatic “male gaze” axiom in one scene. Eyed like a commodity (“I was a chattel, a thing infinitely removed from intimacy”), Hannay further comments, “I hated her instinctively, hated her intensity, but I longed to arouse her interest. To be valued coldly by those eyes was an offence to my manhood, and I felt antagonism rising within me.” (2) Hilda personifies the male “fear of the feminine” paradigm which also affects Scottie (James Stewart) in Vertigo (1958). Mary parallels the harmless, sexless “good mother” image of Midge (Barbara Bel Geddes). Unlike Sherlock Holmes, who has, at least, an intellectual respect for Irene Adler, Hannay exhibits total repugnance for his female adversary. As Stafford notes, Buchan’s women are generally dysfunctional and dangerous in a Great Game reserved exclusively for single men. (3) Women are a dangerous “other” threat to English public schoolboy masculinity along with an alternative male sexual force “that dare not speak its name”. By contrast, Hitchcock’s Alicia Huberman (Ingrid Bergman) in Notorious (1946) and Eve Kendall (Eva Marie Saint) in North by Northwest (1959) are more complex characters representing a more mature perspective. Unlike Buchan’s Mary, both are sexually active femme fatales who can never return to the status quo. They have also been manipulated into accepting their seductive roles by a patriarchal society Buchan never questions. In the eyes of Prescott and The Professor (Leo G. Carroll), they are both “disposable commodities”. Buchan’s fiction does, to its credit, offer alternatives in certain instances, as with Mary’s resilience in agreeing (without any form of coercion) to marry a German spy in Mr. Standfast. Kore Arabin also bravely attempts to make amends for her father’s destructive effects on a Greek village community in The Dancing Floor (1926). But such instances are rare into the world of John Buchan. When he adapted John Buchan’s first Richard Hannay novel, The Thirty-Nine Steps (1915), Hitchcock jettisoned both its public school, “great game” ideology and Hannay’s secure sense of class status. He also decided to neglect the novel’s ‘wrong man’ theme and instead concentrate on questioning social relationships. He kept the novel’s episodic nature of the chase but emphasized the personal odyssey of the couple and their antagonistic relationship to their own society. Although Jocelyn Camp notes that “the structure of a Buchan novel is very like that of a Hitchcock film” in terms of dramatic structure, Stuart Y. McDougal significantly recognizes Hitchcock’s transformative role in The 39 Steps in making the film “an exploration of the nature of male-female relationships” (4). This pattern reoccurs in Saboteur (1942) and the more accomplished North by Northwest. 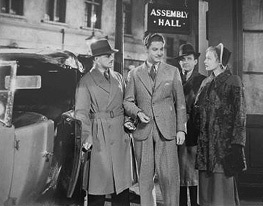 Richard Hannay (Robert Donat), Barry Kane (Robert Cummings) and Roger O. Thornhill (Cary Grant) represent different versions of a John Buchan’s “wrong man”. In the first two films, a chaotic set of arbitrary circumstances proves the wrong man innocent in the final minutes of the film. But although North by Northwest’s screenplay by Ernest Lehman closely follows the episodic nature of Buchan’s The Thirty-Nine Steps and places Thornhill back into the system (like Hannay) before the actual climax, its hero never unquestionably accepts his return like Richard Hannay. Following Devlin’s example in Notorious, Thornhill decides to rescue the heroine and reject the Great Game of his country’s “national interest”. By so doing, he opposes the institutional forces of his society by a spontaneous political action which is also personal by its very nature. Like T. R. Devlin (Cary Grant), Thornhill will not accept an authoritarian decision by his superior, one which Richard Hannay would unquestionably accept. In the last scene of The 39 Steps, Hannay is no longer a “wrong man”. But the film’s emphasis is on how the nature of his relationship with Pamela (Madeleine Carroll) will now develop. By this time, the MacGuffin aspects of the “39 Steps” are long forgotten. Hannay and Pamela’s reunion occurs outside society overlooking a music-hall. 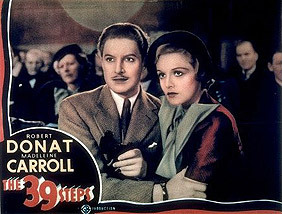 As Ken Mogg notes, The 39 Steps involves a unique element not found in the world of John Buchan, namely the development of a life-affirming subjectivity opposed to a world in which everything appears circumscribed. Unlike rigid and unimaginative personality of Mr. Memory (Wylie Watson), “Hannay has been exposed to a quickening process in very sense (epitomized by his impromptu speech at a political rally).” (5) But the question is where do the hero and heroine move on to now? As Wood astutely notes, “As the hands of Hannay and Pamela meet, we are reminded that, although the handcuffs no longer bind the couple, they are still dangling from Hannay’s wrist.” (6) Like Notorious and North by Northwest, the conclusion of The 39 Steps implicitly suggests that future possibilities for the couple must necessarily occur outside society. But the handcuffs symbolize negative features representing the world they have escaped which may still hinder potentials existing within their new relationship. Hannay and Pamela’s physical survival at the end of the film does not necessarily guarantee the equality of their future relationship. Like any creative director, Hitchcock leaves the issue open and never ideologically resolves it – unlike John Buchan. Although the Buchan hero finds himself temporarily outside society, he is still self-assured of his identity and the possibility of returning to his former class status. A very different picture emerges in Hitchcock. The hero has no real assurance of return. Buchan’s vision is more conservative. But Hitchcock offers the tentative possibility of oppositionally moving beyond social barriers in ways Buchan’s novels can never envisage. Certain members of the Gorbal Die-Hards do climb up the social ladder in The House of Four Winds. Dougal becomes an important journalist while Jaikie gains a second in Cambridge as well as being a good rugby player. But they both become respectable members of an establishment whose codes they espouse even in their earlier youthful incarnations in Huntingtower. It is hard to imagine these Die-Hards moving outside the system and becoming early versions of Cambridge communists such as Guy Burgess and Donald MacLean, and eventually joining Willie Gallagher’s Red shipbuilders on the Clyde. Hitchcock develops further for alternative directions after his move to America. 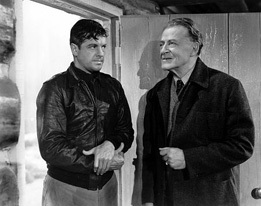 Although Saboteur is a studio assignment delivered to Hitchcock while on loan by David O. Selznick to Universal, it is not devoid of interest. Despite Robert Cummings’s bland leading-man persona and Priscilla Lane’s unsuitability for the role of Patricia Martin, Saboteur represents Hitchcock’s first attempt to rework the Buchan narrative within the context of the Hollywood studio system and a country in the first stages of World War II. Like Hannay’s journey across Great Britain in Buchan’s The Thirty-Nine Steps, wrongly accused saboteur Barry Kane travels from California to New York in search of the elusive Frank Fry (Norman Lloyd). The most interesting features of the film involve the people Kane meets on his journey. While fleeing from the police, Kane encounters outcasts from the American way of life, several of whom ironically reproduce the very ideological mechanisms that rejected them in the first place. Others do not. Barry encounters Patricia’s blind uncle in a scene that evokes the meeting between the hermit and the creature in James Whale’s The Bride of Frankenstein (1935). Although blind, Patricia’s uncle treats Barry as a human being in contrast to his hostile niece who earns her living appearing on advertising boards involving false images of glamour and consumerism. One sequence, perhaps influenced by Tod Browning’s Freaks (1932), sees the fugitives seeking refuge amongst a circus community comprising human skeleton, bearded lady, fat lady, Siamese twins and midget. They represent the divided state of American society at the time as Ken Mogg notes. (7) While the human skeleton believes Barry, the hostile midget known as “The Major” (his institutional name no accident), is ready to hand him over. However, the human skeleton’s arguments eventually prevail over other members of the group such as Siamese twins who incessantly quarrel over everything, a passive bearded lady, and a neutral fat lady. Later, Barry later learns that the ironically named villain, Mr. Freeman (Alan Baxter), may have resented his mother who kept him in little girl clothes for a long period. Freeman also informs Barry that he has problems in his own family with a destructive young son! This character resembles a very early draft of Norman Bates. It also reveals Hitchcock’s awareness of disturbing personal and political problems within the American way of life. Mr. Freeman’s Fascism has deep associations with the American family. Like Saboteur and North by Northwest, The 39 Steps includes a political comment by its hero. These brief political comments are so non-dogmatic and open-ended that no system can ever ideologically recuperate them for purposes of social control. They resemble Karl Marx’s astute comments on a utopian society where everyone is free to take up the responsibility of both work and leisure, a desire that his authoritarian successors never achieved nor desired in the first place. Thrust into a political meeting, Hannay has to act the role of a politician. But his spontaneous comments contain more genuine and caring feelings than any carefully prepared speech by past and present spin-doctors. Hannay conjures up a utopian world of personal and political dimensions far beyond anything contained in Buchan’s novels. It is a world appealing to oppressed members of any gender, race and class group, past, present and future. And I know what it is to feel lonely and helpless and to have the whole world against me, and those are things that no man or woman ought to feel. And I ask your candidate and all those who love their fellow men to set themselves resolutely to make this world a happier place to live in, a world where no nation plots against nation, where no neighbour plots against neighbour, where there is no persecution or hunting down, where everybody gets a square deal and a sporting chance and where people try to help and not hinder. A world from which suspicion and cruelty and fear have been forever banished. That is the sort of world I want. Is that the sort of world you want? Hannay’s speech belongs to no party political agenda and never occurs in the original novel. It is naïvely apolitical. But it also contains spontaneous utopian features representing personal and sincere beliefs on the part of the director. Its opposition against human injustice and human suffering transcends any status quo orientation. Hannay speaks from the heart. His words may be naïve and foolish from a cynical, political, spin-doctor perspective. But they transcend Buchan’s limited perspectives. They oppose institutional values by suggesting that things can be different. Barry Kane’s speech in Saboteur is less memorable. It represents more of a “Why We Fight” discourse related to Hollywood’s ideological support of World War II. But Saboteur’s politics are more visual. Otto Kruger’s debonair upper-class character, Charles Tobin, not only embodies Fascism’s contemporary appeal to the wealthy elite of America and Britain. Tobin also reveals disturbing breaches between political and personal features of everyday life. He can initially appear as benevolent grandfather and then suddenly revert to becoming a ruthless opponent. T and his family coldly (with the exception of his little granddaughter) watch Kane being taken away by the law. Their polite, unemotional attitudes evokes contemporary parallels to those bland personal lives of Adolph Hitler and Heinrich Himmler (who could not stand the sight of blood) and their deadly political actions. Later, Tobin’s New York society accomplice, Mrs. Van Sutton (Alma Kruger), desires that the “messy” fate awaiting Kane and Patricia occur outside her clean palatial mansion. Hitchcock’s debonair villains see no contradictions between their polite world of institutional class manners and their public acts of violence. Both they and Buchan’s Hannay belong to the same social world. But Hitchcock sees this division between the personal and the political as monstrous in nature. Gene D. Phillips also sees Saboteur as Hitchcock transplanting The Thirty-Nine Steps to American soil. But he also notes that its treatment of the villain is not as inadequate as most critics assume. Phillips comments that Tobin appears in long shot during his last appearance in the film, suggesting “that Tobin and his kind will continue to carry on their treasonous activities against the United States ” (8). He amiably greets a uniformed dignitary before the scene fades. Perhaps the devious manipulator may convince the authorities that he was really a double agent and eventually help Nazi rocket scientists and fugitives such as Adolph Eichmann and Dr Mengele escape justice at the end of the war? Although limited by the Hollywood propaganda nature of Saboteur, Hitchcock and script collaborators Peter Viertel, Joan Harrison and Dorothy Parker collectively attempted to undermine status quo values. Bill Krohn notes that Parker’s draft of the screenplay contained anti-establishment comments directed at the American upper class and capitalism in general “which did not escape the attention of the Production Code office” (9). Despite initial reservations, the mother of Barry’s murdered colleague does help him escape from the law. Her action reveals a tension between obeying the law and her intuitive recognition concerning injustice against a “wrong man”. Although she appears in a brief sequence, Hitchcock here suggests that not all American others are totally bad. Perhaps her working-class status makes her different from the other mothers in Hitchcock films. North by Northwest involves a significant personal development for its main character. As Jocelyn Camp and Robin Wood note, the hero not only foils the plot but undergoes a significant character transformation foreign to both Buchan’s original novel and earlier film versions. North by Northwest appears to reproduce the conclusion of The Thirty Nine Steps by bringing its hero back into the home team. But while Buchan views reincorporation as positive, Hitchcock sees it as regressive. Thornhill learns that his own political system allows Eve to use her body in the national interest without any concern for her personal danger. Thornhill’s reaction to The Professor’s attitudes occurs in a “throwaway” fashion within the narrative. But its implications are subversive if one considers the Cold War ideology dominant during the films’ production. Hitchcock not only condemns Buchan’s “great game” but also an institutional system victimizing both those it supposedly protects as well as those manipulated pawns like Eve acting in the national interest. Thornhill: Do you think I’m going to let you get away with this dirty business? Thornhill: Nobody has to do anything. I don’t like the games you play, Professor. Professor: War is hell, Mr. Thornhill, even when it’s a Cold one. Thornhill: If you fellows can’t lick the Vandamms of this world without asking girls like her to bed down with them and fly away with them and probably never come back, perhaps you ought to start learning to lose a few Cold Wars. Such a comment uttered in the Cold War era would have resulted in Hitchcock’s blacklisting had not North by Northwest been marketed as a lightweight work by that most conservative and glamorous of studios, MGM. Viewed within this historical context, Thornhill’s statement is a remarkably bold criticism of the abuse of human lives practiced by two opposing systems whose differences are less than they appear. As Patrick McGilligan notes, this was not the first time “Hitchcock had sneaked digs at the Red Scare into several of his films” as certain lines in To Catch a Thief (1955) and The Man Who Knew Too Much (1956) reveal. (10) Although Thornhill’s speech may appear as naïve as Hannay’s in The 39 Steps, it condemns the ideology of John Buchan. The author did recognize a thin dividing line between order and chaos. But he stubbornly continued to affirm establishment codes and ideals in his fiction. Buchan closed his mind to the contradictory nature of his own society. Hitchcock’s attitude was more complex. He depicted explicit contradictions to the status quo in his films. Hitchcock allows Thornhill to articulate both a personal and political attack on a society whose deadly and deceptive nature he never before recognized. Like Hannay in The 39 Steps, Thornhill may speak naïvely. But he also intuitively and imaginatively envisages a world where justice might prevail and things become humanely different. Thornhill moves from being an empty figure into a more real and alive person thanks to his relationship with Eve. As he tells her before their enforced separation by the Professor, “I never felt more alive.” But Thornhill’s newly developed sense of vitality creates oppositional qualities within his own persona. He will never again take his former social world for granted. At the end of North by Northwest, Roger and Eve finally travel together in a sleeping car on the way to New York. They now spontaneously recreate their earlier encounter once part of a grim political game. Buchan’s “great game” now becomes a pleasurable personal union with two characters engaging in performances involving personal fulfilment. Like characters in a Howard Hawks film, they now exist apart from society. Roger and Eve inhabit a confined, but fulfilling, private space resembling those occupied by couples in Twentieth Century (1934), I Was A Male War Bride (1949) Rio Bravo (1959) and Man’s Favorite Sport? (1964). Perhaps Grant’s performance in the film recalling certain moments from his roles in Hawks comedies may not be accidental? Roger and Eve travel towards some unknown destination. But like Hawks’ heroes and heroines, they can now attempt to engage in a more personally fulfilling relationship than they could ever have done in their previous social worlds. Hitchcock’s final creative version of The Thirty Nine Steps leaves John Buchan behind for good. Roger and Eve become alive in more senses than one. They not only intuitively reject the establishment codes and social values in the world of John Buchan but also begin a tentative journey towards becoming more fully human than their social worlds and “private traps” (as in Psycho) have hitherto allowed. Buchan can envisage no alternative to the established society he affirms in his various novels. But Hitchcock intuitively feels that things can be different. I wish to thank Robin Wood for his helpful suggestions concerning the drafting of this article. François Truffaut, Hitchcock (London: Panther, 1956), p. 102; Pat Hitchcock 0’Connell, and Laurent Bouzereau, Alma Hitchcock: The Woman behind the Myth (New York: Berkeley Books, 2003), p. 101. John Buchan, Greenmantle (Boston: Houghton Mifflin, 1916), pp. 218-9. David Stafford, “John Buchan’s Tales of Espionage: A Popular Archive of British History”, Canadian Journal of History, 18.1, 1983, pp. 1-22. Jocelyn Camp, “John Buchan and Alfred Hitchcock”, Literature/Film Quarterly, 3.3, 1975, p. 231; Stuart Y. McDougall, “Mirth, Sexuality and Suspense: Alfred Hitchcock’s Adaptation of The Thirty-Nine Steps”, Literature/Film Quarterly, p. 232. Ken Mogg, The Alfred Hitchcock Story (London: Titan Books, 1999), p. 49. Robin Wood, Hitchcock’s Films Revisited (New York: Columbia University Press, 1989), p. 283. Gene D. Phillips, Alfred Hitchcock (Boston: Twayne Publishers, 1984), p. 102. Bill Krohn, Hitchcock at Work (London: Phaidon Press, 2000), pp. 42-3. Patrick McGilligan, Alfred Hitchcock: A Life in Darkness and Light (New York: Regan Books, 2003), p. 559.